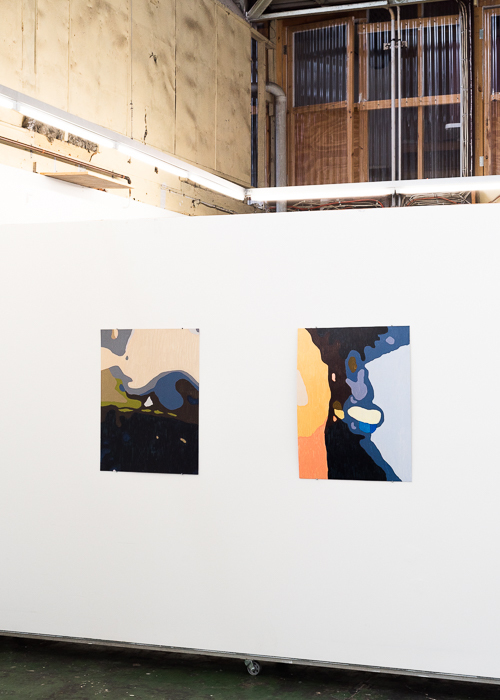 TJ: For those unfamiliar, Filling In is part of a larger series of works/shows. Can you elaborate on that for us? 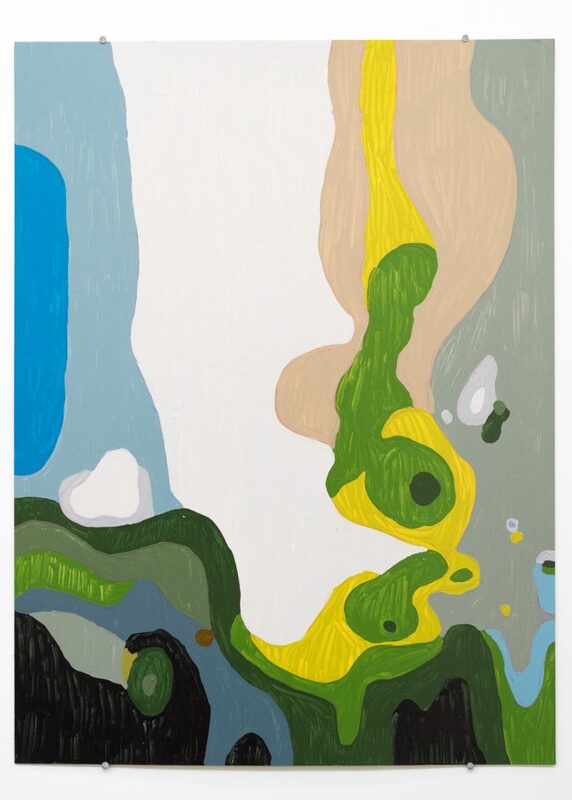 IK: Filling In will be the second of a three-part painting series of abstract landscapes. 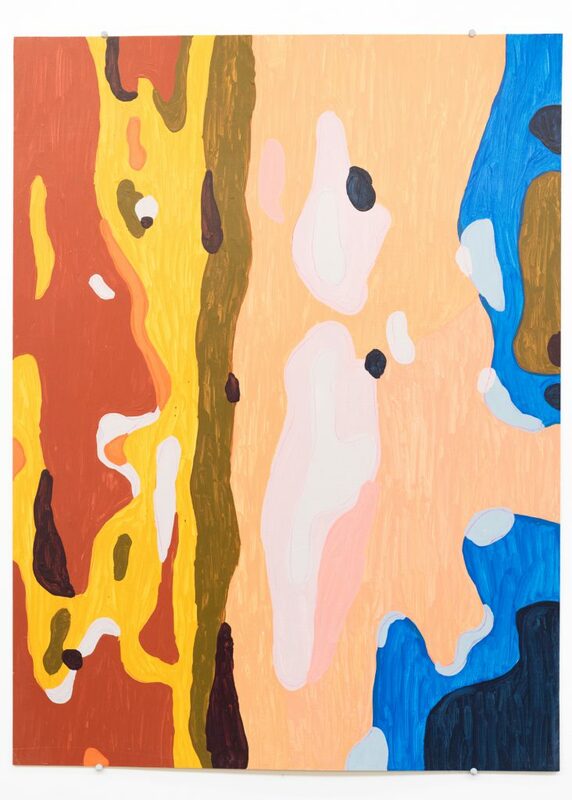 The idea of creating abstract landscapes was kind of like picking up from where I left off when I finished my Fine Arts degree and was applying for a residency at Police Point Shire Park, Point Nepean. Generally speaking, the three instalments follow the coastline of Port Phillip Bay, which I’ve currently broken down into the Mornington Peninsula and Melbourne, and then maybe the third part will be around Geelong. And engagement with the female narrative and physical figure is quite important here too isn’t it? Each painting tells a story of a woman who once existed in and made a contribution to her community (big or small). I knew when I started the first part that I wanted to investigate areas that had been built by the efforts of women in history who helped contribute a service to their local social landscape. The female body has (almost since the beginning of time) been linked to the landscape in which men have often explored, claimed ownership of, and disregarded as an equal. So instead, I have produced paintings named after, and inspired by women who were very much active, in charge, and who helped mould the places around them in some way. I think at the time when I had finished my studies I was really I was looking for some inspiration and guidance regarding my own career. Given that Die Ländereien was based upon the geographies and leading females of the Mornington Peninsula, are the new works similarly location-specific at all? Yep! So, this time I’ve tried to follow the bay. I’ve focused in on Melbourne’s inner suburbs and have visited sites like Beaumaris, where painter Clarice Beckett lived, and then spots in Fitzroy, Carlton, Brunswick, Brighton, Sandringham, Docklands and Williamstown. I was able to choose these areas and specific points once I had a person and story I was interested in and wanted to explore further by being physically there. Did you initially see this larger project being a series consisting of three instalments that are essentially separate but very connected? I actually did. Though it was vague, I originally envisioned all three parts to be a lot more cohesive. While the concept remains the same for the first two parts I have finished, there are quite a few differences aesthetically, and I think my practice changed a little bit over time. Like in Die Ländereien I created 12 larger more colourful, looser paintings. I kind of cringe when I see some because they seem less finished compared to the paintings in Filling In that have a far more restricted palette and seem a lot more controlled and focused. I've noticed the works are made almost, if not totally, exclusively on plywood which although rather rigid, can also be a little unpredictable - is there a conceptual purpose behind that choice at all? To be honest, it’s just what I had when I first started painting at uni. Sometimes I wish I was more ‘professional’ or ‘mature’ and used better quality materials, but over the years I have become quite fond of the grain and the patterns that can be found on plywood sheets, and I think they complement my painting style. Sometimes it does warp and I really have to plan to treat the wood accordingly. There really isn’t any concept behind the plywood though. However I think that in my method of applying paint, I consider it more as ‘colouring in’, and I kind of need to treat the plywood like sheets of paper in that they should be easy to move around and not too special or intimidating. Is it too early to ask what's in store for the third instalment of this project? 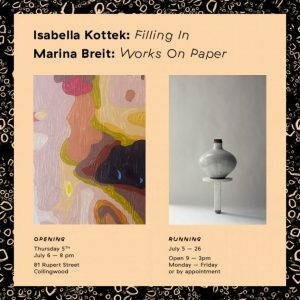 Isabella's Filling In runs alongside Marina Breit's Works on Paper until July 26th at Schoolhouse Studios, 81 Rupert Street Collingwood.